THERE has been an intense debate in the Punjabi world of letters about the nature of poetry, particularly the prosodic problems associated with rhyme, patterns of sounds and beats. Free verse was not accepted by Punjabi poets in the early years of the 20th century despite Prof. Puran Singh’s contribution to this genre. Even in the modern times the most celebrated Punjabi poets like Prof. Mohan Singh, Shiv Kumar Batalvi and Surjit Pattar owe their popularity to lyricism, which their verses exude in abundance. However, there are many poets practicing free verse in Punjabi and some of them are doing extremely well. Mention may be made of Parminderjit, Mohanjit, Manjit Tiwana, Amarjit Chandan, Dev, Harbhajan Halwarvi, Pal Kaur to name only a few. 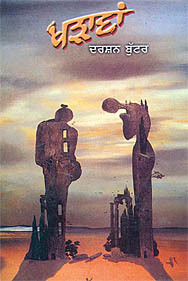 Among the younger lot Darshan Buttar is doing pretty well and now he has joined this coterie with his fourth collection of poems titled Kharhawan (a pair of wooden sandals) published by Chetna Parkashan, Ludhiana. Buttar is a sensitive poet of delicate phenomena of life articulated through succinct phrases and structures. In the poem Sama (time), he says, Mai sama han.../Maut ton baad hi/Shanakhat karanga shakhas di/...Mere kol kujh fikar ne/... Khushaam-deed/Bahut pichhe chhad aia han." (I am time and I give recognition only after one’s demise. I carry loads of worries and have left all warm greetings far behind). The time then finds that its movement has gone awry in the present. Therefore, it has flooded the earth with acid rain and turned the rivers into sandy expanses. The birds and flowers are struggling for survival. The poet is piqued by those who permanently display "good bye" on their doors. He states, "Ghanti vajdi hai/kutta bhonkda hai/talkhian ‘ch khulde ne buhe/Bechainian ‘ch band hunde ne/Maryada/ Rahu-reet/Rivaz/Sabh purane gharan dia vastan." (The bell rings and the dog barks. The doors open and close in a huff. Conventions, customs and traditions are relics of the past now.) The poet rues the change in attitude and vision of the present generation when sympathy, love, affection, respect and reverence are treated like muck. Samadhi (trance) is one of the best poems in this collection. The poet in this poem gives a description of the state of mind in samadhi. "Samadhi ’ch.../Khulian hundian ne akhan/Palkan band hundian ne/Samadhi ‘ch.../Adikh rahan de/Safar te hunde han/...Smadhi ’ch /Dukhan da/Sukh bhog rahe hunde han.../Smadhi ’ch Asin sach naal/khare hunde han/...Smadhi/shabad di/chupp kitab hai/Smadhi.../Shrishti nu/Drishti vand di hai/...smadhi kade smadh nahi bandi." (The eyes are open though eyelids are closed in trance and one is on a perpetual peregrination along unseen paths...one draws peace and pleasure from pain in trance while standing by one’s true self. Trance is a silent book of the world that lends vision to creation and it never becomes a tomb.) From meditation and trance the poet rises and moves in the world shod in wooden sandals (khrhawan) like the sages of the yore. The wandering sadhus have no particular destination. The wooden sandals join words with wanderings that unleash illuminating dialogues leading to an awakening of consciousness. The poet avers, "Khrhawan...siran wale pairan lai hundian/... Khrhawan.../Kujh ku pairan lai hundian." (Wooden sandals are meant for feet with heads, the chosen few that are always on the move.) They are a symbol of movement from one stage of consciousness to another. A few poems in this collection reflect on war. The poet says: "Jang de dinan ‘ch/Raat tan hundi hai/Din varga kujh nahin hunda.../Jang da/koi dharam nahin hunda/jang khoh lainda/Sade sukh...chain...aaram/ Puttan wang paalian ichhawan Rukhan wang katt dinda/ Swedna de dive bujhaunda... /Fiza ‘ch barud gholda." (There is only night in the time of war, nothing like day is left. War has no belief or faith. It robs us of our peace, comfort and repose. It chops our much-cherished desires like trees in the forest are hacked. It blows out the lamps of sensitivity and dissolves the stink of gunpowder in the wind.) The poet goes on in the same vein. He states that war is a tale inscribed by smutty times on the fare breast of the mute earth. In the days of war man is minus man and he starts using an alien lingo. After the last war, the poet believes, "perched on a heap of ashes, eternal night will celebrate the death of man." Darshan Buttar is very sensitive to his surroundings though he never lets his emotions get the better of him.